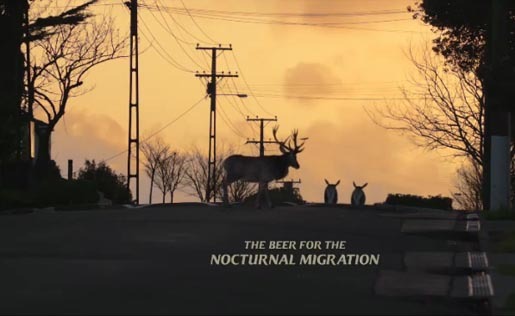 Tooheys Extra Dry brings back the Stag, the Tooheys brand symbol since 1869, in “Nocturnal Migration”, a television commercial starring male (stags) and female (does) deer in downtown Auckland, New Zealand. 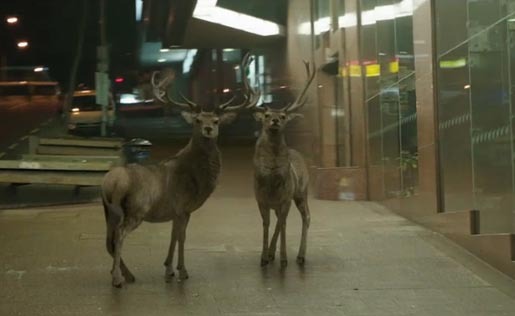 Set to “Breathe”, the 1996 track by The Prodigy, the ad shows the creatures of the forest heading to the city by foot and public transport to live it up in night clubs, pubs and on the streets before heading home to the suburbs at dawn. The commercial is part of an integrated campaign including outdoor, print and digital ads featuring stags, along with street posters and giant paste-ups placed around the city on nocturnal migration routes. 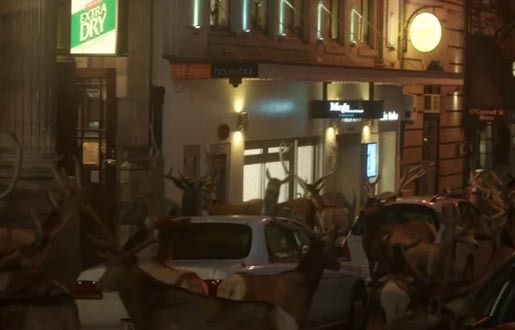 A teaser print and online campaign kicked off a week before the launch of the commercial on September 25. 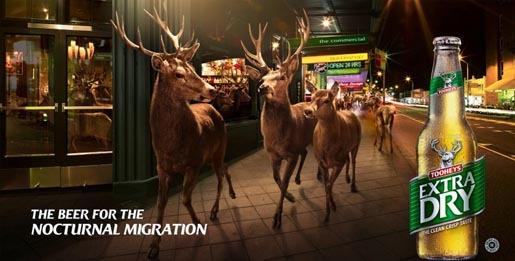 The Nocturnal Migration campaign was developed at BMF, Sydney, by executive creative director Dylan Taylor, creative director Shane Bradnick, art director Corinne Goode, copywriter Phil Sicklinger, account director Tony Dunseath, creative founder Warren Brown, senior planner Simon McCrudden, head of television Sue Hind, art buyer Sarah Thompson, head of print production Libby Hams, working with Lion brands director Jon Bradshaw, marketing manager Andy Disley, brand managers Judy Fraser and Ben Davis, and assistant brand manager Naomi Gavan. Filming was shot by director Garth Davis via Exit Films, Sydney, with producer Karen Sproul. Photographer was Stephen Stewart. 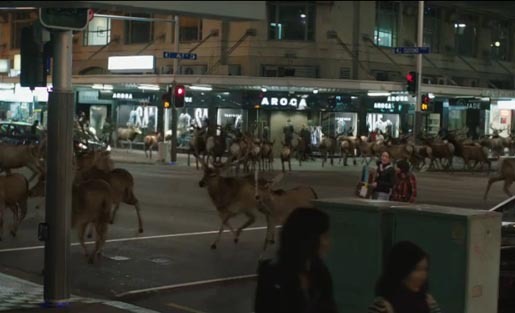 Post Production was done at Alt.vfx, Brisbane, by Colin Renshaw and Takeshi Takada. 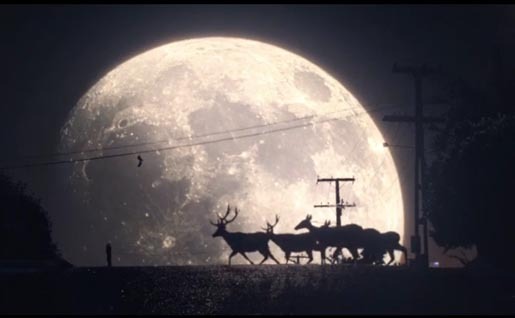 Digital work was done by Holler Sydney.